Founders of now widely-practiced yoga styles like Ana Forrest, Bikram Choudhury, and B.K.S Iyengar had their dedicated followings, but the likelihood of meeting, or even connecting with these yogis was slim (or non-existent). Through social media, it’s now so easy for yoga teachers and personalities to create — and continually connect with — a fan base and influence their practice in myriad ways. The really cool thing about this is that the new generation of yogis have been able to carve out their own styles to share with, and inspire, the rest of us. Here are 6 yogis revolutionizing the way we practice with their unique styles, strength, and positive messages. There’s no way around it, this girl rocks. Kathryn has made her mark on the yoga world with her humble, strong, and humorous attitude. She embodies what it means to be comfortable in her own skin and portrays this in her practice. She is a master of strong poses, handstands, and arm balances. Her approach is inspiring rather than trying to impress and she truly makes you believe that anything is possible in your own practice. From writing and filming weekly classes for multiple yoga sites, traveling the country to teach classes, and recently writing her first book, Budig and her teaching are extremely accessible. Shiva is not new to the yoga scene. She's been teaching for 25 years, but her staying power is undeniable. In a world of Instagram-filtered yoga snaps, Shiva stays true to her deeply spiritual style of teaching and living. She travels the world sharing her Vinyasa style, activism, and positive energy. Her classes will take you much deeper than your average studio class, exploring the depths of your mind, body, and soul. She focuses on breath work, meditation, and a connection to your entire life. She is doing a beautiful job of keeping a more traditional style of yoga alive in a modern landscape. What “yoga girl” did was incredibly smart: she picked a highly effective Instagram handle at the beginning of the “yogigram” boom, helping her become one of the most followed "Insta-yogis" with 2 million followers, and for good reason. Her beautiful Aruba-based images are the ultimate in yoga wanderlust. But Rachel isn’t just talking the talk, this yogi has been practicing for years and has an incredibly inspiring practice and lifestyle. She mainstreamed the idea that yoga can be a career, and that being successful outside the 9-5 office job on a tropical island IS possible. She's honest about the struggles she’s faced, including drug addition, and the power of yoga to heal. This is an important message and one worth sharing with millions of people looking for ways to combat the demons in their own lives. Her impact will be one of getting people to start a practice and believe in their ability to commit to it. The first thing that comes to mind whenever I see a new post from Dylan Werner is “that’s crazy.” This guy is crazy strong, crazy focused, and crazy good at yoga asana. He is a master of creative transitions, seemingly impossible balances, and gravity defying handstands. He posts tons of cool yoga and AcroYoga videos to go along with his pictures taken all over the world. If you need inspiration to take your practice to the next level, this is your guy. Laura Kasperzak is the ultimate example of balance. This yoga mama's posts vary from awe inspiring forearm stands, to playful poses with her children, to sneaking in a few poses at the office. She is a wonderful example of the need for yoga in our lives as a time for ourselves amidst all the chaos. She’s incredibly relatable in her approach (although perhaps not in her seemingly superhuman flexibility). Her practice is strong, graceful, and creative and will be sure to inspire you to fit yoga into your busy life. You’ve probably seen Jessamyn featured in various websites and magazines, and you probably remember her because she looks different from how yogis are usually "marketed" and depicted in media. That is what makes Jessamyn so revolutionary: she does not fit the cookie-cutter mold of many yoga teachers, but instead embraces her full figure as a way to promote a body positive practice. 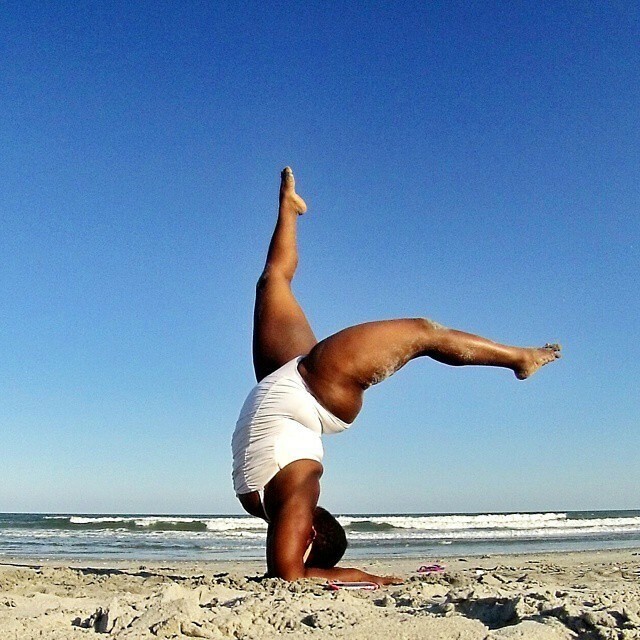 She encourages others to conquer their fears of not fitting in a yoga class because of their body and advocates for a more inclusive yoga (and world) culture. She also has some really inspiring photos that will help you amp up your own practice. The modern yoga world is vastly different from what it was even 10 years ago. While some may see the oversaturated and often "watered-down" versions of the modern practice as a negative, the accessibility of yoga is no doubt helping millions of people find their way to the practice. Being inspired daily by these yogis is just one way to stay committed and ambitious in your own practice. It’s a real gift to reap the wisdom of so many talented yogis even just from the screens of our smartphones, and it's one that will truly revolutionize the way we are able to practice yoga.